Sometimes a girl just needs a hearty kale salad. There’s no explaining why; she just does. So move out of the way and give her that kale salad. She deserves it. That and the chocolate. Give her all of the chocolate. Since my first few experiences with kale, wherein I couldn’t figure out how to mask its bitterness or sturdy texture, I’ve grown to love this shrubby green. When prepared right, it makes the perfect addition to smoothies, salads, breakfast scrambles, and dips. I’ve recently been loving it in salads because it’s heartier than other greens – such as spinach – and leaves me feeling full and satisfied. Not to mention, nutrients. So, many, nutrients. The dressing comes together quick and packs tons of garlicky flavor, thanks to quick roasted garlic! If you’ve ever roasted a head of garlic, you know the struggle of waiting the grueling hour of cooking until its completion. Longest hour of my life. But you guys know I’m impatient (30 minutes or less ring a bell?). So I crafted a way to quick-roast garlic by separating the cloves. Then you only have to wait 20 minutes. Guys, think of all the things you can do with that 40 minutes you get back in your life. Cartwheels, dancing, hugging, snacking. You can do whatever you want with it. You’re welcome. The other star of this recipe? The tandoori-roasted chickpeas. I made a Masala Tofu Scramble a while back and fell in love with this smoky spice combination. The good news is, if you’re a speciality spice newb like me, Whole Foods has a Tandoori Spice Mix that’s to die for. I recommend looking for that next time you’re there! Otherwise, I have notes for how to make your own with just a few ingredients. Once your (quick) roasted garlic-tahini dressing comes together, all that’s left to do is pour, toss, and top it with chickpeas! Then go to flavor town. My treat. Even if you’re not a big spicy food lover, you’ll love this salad. Think more smokiness and depth of flavor rather than heat. Not to mention, the subtle sweetness of the dressing brings balance so it’s not overwhelming. This salad would be an excellent entree for a weeknight meal, or for hosting vegan or gluten free friends and family. It’s so hearty it stands on its own as a main dish! But hummus and pita or naan would make excellent additions. If you make this recipe, let us know! Leave a comment and rate it! It’s so helpful for us and other readers. And don’t forget to take a picture and tag it #minimalistbaker on Instagram so we can see! We’d love to see what you come up with. Cheers! 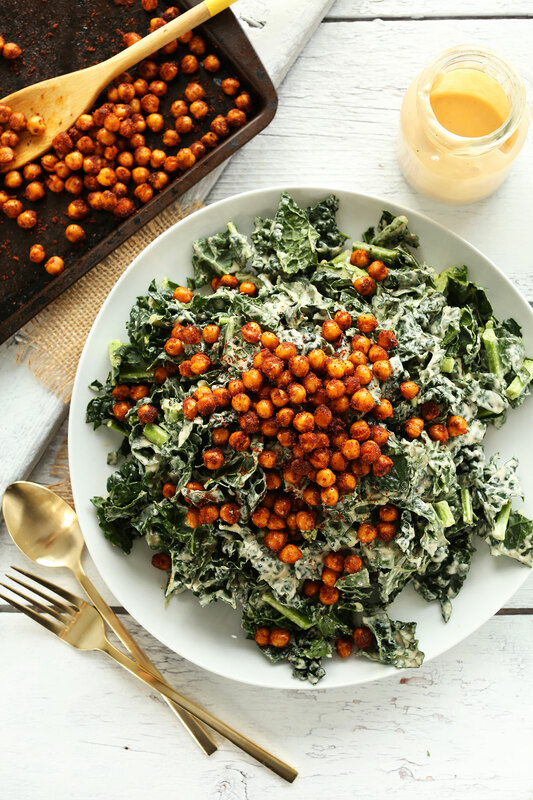 SUPER flavorful, 30-minute Kale Salad with a creamy roasted garlic tahini dressing and crispy tandoori roasted chickpeas! Peel apart garlic cloves but leave the skin on. Preheat oven to 375 degrees F (190 C). 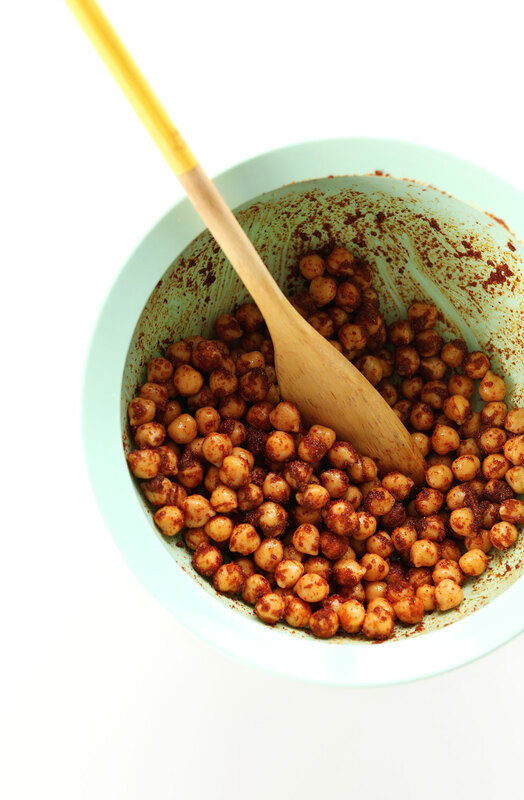 Add drained chickpeas to a mixing bowl and toss with oil and seasonings. Add garlic cloves and seasoned chickpeas to a baking sheet. Drizzle garlic with a bit of olive or grape seed oil. Bake for 20-23 minutes or until the chickpeas are slightly crispy and golden brown and the garlic is fragrant and slightly browned. Remove from oven and set aside. Squeeze garlic out of skins / peel away skins and add to a mixing bowl. Add all remaining dressing ingredients and whisk vigorously to combine, smashing the garlic with the whisk. Taste and adjust seasonings as desired, adding more lemon for brightness and maple syrup for sweetness. Set aside. Add kale to a large mixing bowl. Before adding dressing, add 1 Tbsp each lemon juice and olive oil (amount as original recipe is written // alter is adjusting batch size) to the kale and massage with hands to soften the texture and lessen bitterness. Then add as much dressing as desired (some may be leftover) and mix with a spoon. Top with chickpeas and serve. Best when fresh, though leftovers keep in the fridge for up to a few days. *I bought my Tandoori Masala Spice blend at Whole Foods (it's the Whole Foods Market brand), but you can easily make your own (see next note). *DIY Tandoori Masala Blend: 3 Tbsp cumin, 2 Tbsp garlic powder, 2 Tbsp paprika, 3 tsp ginger, 2 tsp coriander, 2 tsp cardamom. Multiply as needed. This Shawarma Spice Blend is also delicious and quite similar. *2 medium lemons make ~1/3 cup lemon juice. *Nutrition information is a rough estimate calculated with olive oil, the lesser amount of maple syrup, and all of the dressing. Loved this recipe! I made my own spice blend following the instructions since I had all of those spices on hand individually and it worked great. Also, just used 1 really fat large clove of garlic instead of 2. This salad is delicious! I’m not the biggest fan of kale or chickpeas- I like them okay, but after this I’m sold. The dressing is the real star. It almost tastes like a Caesar dressing, which was such a pleasant surprise. Overall, super fresh, delicious, and filling! Highly recommend. I literally have NEVER left a comment for anything but hot damn Dana, this salad is the BOMB.COM. Hi! I love all your recipes! Unfortunately, I don’t like tahini and I was wondering if you could suggest an alternative here? Maybe yogurt? We just made this dressing the other night. We subbed out tahini for cashew butter. It was simply amazing. We are hooked. Thank you for all the great recipes – so much flavour and so simple!!! 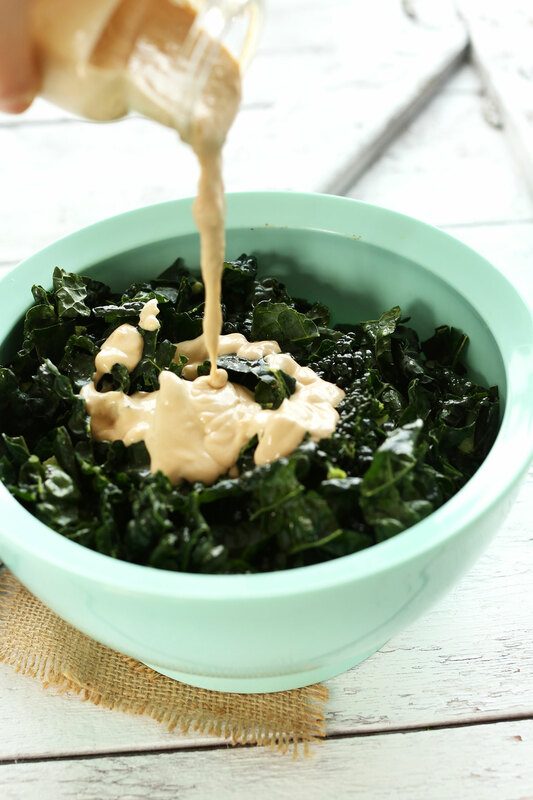 My all time favorite kale salad recipe!!! what kind of tahini should I buy? hulled or unhulled? Dana this was SO GOOD!!! Wow so much flavor! I roasted cauliflower and carrots along with the chickpeas. Delicious! I LOVE this salad and make it every week. It’s so delicious. I ordered Tandoori Masala spice from Walmart, as I couldn’t find it in local stores. I also follow the instructions from your crispy baked chickpea recipe to make the chickpeas for the salad. This recipe is so customizable and the dressing is fantastic! I adore this salad and make it every week with one additional step: I squeeze the juice of three (not two) lemons, and after the kale is clean, dried, and shredded or chopped, I pour a bit of lemon juice onto the kale and mix it well, letting it rest while I make the dressing. The lemon juice tenderizes the kale. Makes a difference. Interesting flavors! But watch out for the garlic. I got a little carried away and now I’ve got a little gas problem! ? guess I’m sleeping on the couch tonight! This was so good! I used Trader Joes frozen minced garlic and just googled how to roast that! This was delicious! Hello again, Dana! I must say this was a WOW! I’m with you on wanting to eat Kale because it is so good for you, but I haven’t been a great fan of it in salads. This dressing has changed my mind! I’m a BIG garlic fan so you had me at garlic. After trying it on the kale I was in more enamored with it. My husband loved it too! btw, i like the crispy chickpeas standalone better than the one here. the crunchier the better! Thank you for sharing all of these wonderful foods! Yay! We are so glad to hear this, Susan! Passing this on to my co-workers and Dr. Love it! Thanks for the love, Cari! Another Minimalist Baker recipe for the win!! This salad was bursting with flavor. I cut a few corners- used jar garlic instead of roasted (I know, I know, but I didn’t have any fresh garlic on hand! ), bought a red tandoori spice mix at wegmans because I couldn’t find tandoori masala, and used a baby kale salad blend I bought at the store. It was so simple and quick to make, and is definitely becoming a staple! My fiancé won’t eat anything without meat, so I’ll bake some shrimp to put on his. Thank you for sharing this amazing recipe! Yay! We are so glad you enjoyed this salad, Danielle! If you have an air fryer you can roast the garlic and chickpeas as well. Wrap the garlic in foil and air fry for 10 to 20 minutes 400 degrees. For the peas, coat with spices and toss into the basket. Shake the basket every 7 minutes til crispy. I just made this (made my own seasoning as per the recipe) and was surprised that the chickpeas not only didn’t have any real taste, but tasted kind of bad. Kind of.. feet-y? Moldy? Has anyone encountered this issue? Could it be because I didn’t dry them 100% before tossing them in the spice and oil?? May be bad chickpeas right out of the can. Get another can, try a major brand and look at the date. Try one straight out of the can. Maybe you just don’t like chickpeas? So good! I’ve made this 4 times now and it’s my new favorite. The only change I make is in roasting the chickpeas. I roast for 35-40 min. 375 degrees with no oil (“dry roast”). Then I add a little oil and the spice at the end. Super crisp! I love this salad, but my husband always complains when I use lemon juice in recipes! Could I sub Apple cider vinegar for the lemon juice? Would the ratio remain the same? Yes, that should work! I would start with less and add to taste! This was so so good! I seriously could just drink the dressing! I made it exactly as written, using the note on subbing the spices. Yum! This was A-M-A-Z-I-N-G , and I am a KALE HATER! Thank you for this quick and delicious recipe! You converted this Kale hater ! This was a big hit last night at a dinner (also made / brought your lemon bars!) but I had to double the time roasting the chickpeas – even though they seemed “throughly dried”. but yeah. excellent! I have been making this salad at least once a week for YEARS at this point and it is my absolute favorite recipe. It is hearty and flavorful and incredibly satisfying and I find myself craving it more often than not. The tang from the lemons, creaminess of the tahini, and flavor from the garlic make this the best salad dressing you could ask for. My only suggestion is using dried chickpeas as opposed to canned- makes all the difference despite the extra work. THANK YOU DANA! I was crazing something healthy that could be made come from what I had on hand. Came across this receipe while searching kale and wow wow wow. !!!!! This is an amazingly recipe and so easy to make! I tossed in some avocado too. Thanks so much for your web site. Love your recipes!!! I tried this recipe tonight, So yummy! I didn’t have any tahini so I used peanut butter instead and repleaced one tablespoon of olive oil with sesame oil. Turned out well! Thanks for another amazing recipe, Dana! Phenomenally delicious! Made this tonight and can’t wait to have the leftovers in my lunch tomorrow. My house smells so good from the roasting garlic and chickpeas! I will definitely be making this again! Amazing recipe! I also added pomegranate seeds- highly recommend! I’ve made this recipe a few times now and it’s one of my favorites! Last night we had it topped with your vegan Parmesan and with buffalo cauliflower, and it was reminiscent of a Caesar salad and buffalo tenders. Thanks for all your creative and delicious recipes! I don’t usually love salads, but this was great! My chickpeas turned out perfectly spiced and crispy. I had a lot left over from the dressing and it has a pretty intense lemony flavour so I didn’t use too much of it, but it makes the kale really delicious! And it’s so healthy! Dana! Another winner for sure! As a vegan, looking to focus on whole foods, I was determined to eat salads for lunch, but was so afraid of how boring that would be. Your recipes are absolutely delicious!!!! And not even close to boring! I had a whole party in my mouth with these robust flavors. Thanks for sharing!!!! ??? I made this as a salad for a BBQ this weekend. It was SUCH a hit. Highly recommen! I made this recipe last night and am still drooling over it. The garlicky dressing mixed with kale is amazing and takes away that bitterness, which usually means I leave kale out of the salad and opt for something else, but last night, it was the star of the dish for sure. You also have my boyfriend addicted to crunchy and crispy chickpeas and we will be making those regularly! This is my favorite kale recipe yet. It’s become a weekly meal for me! Think it would be good as a wilted salad? It’s a crowd pleaser, the bowl is always left empty by the time we are through with dinner. When I visit your website on my phone it keeps having a silent audio track that means I can’t browse your site and have music or a podcast at the same time! I was reading through the comments and someone had said that when they opened their over after roasting the garlic, it looked like it had exploded all over the inside of the oven. I got obsessed with how good this recipe was, I have made it 5 times in the past two weeks! Well once, one of the garlic cloves did appear to have exploded in the oven. So I tried roasting the garlic with foil covering it, but then it didn’t roast in time, and I ended up first roasting covered for 25min, then uncovered for another 5min and it turned out fine (to minimize any explosions). Interestingly, when I took out the chickpeas from the over this same cooking session, one of the chickpeas popped! I just made this salad. I have made a few variations of the tahani dressing and a few variations of the chickpeas but these are the best. Amazing combination with the kale. Thank you! I am thinking of making this with black garlic instead of roasted garlic, but a quick question, kale is not liked by any of our family members, what other green vegetable would you recommend? Hi! Hmm you could try a lettuce? I haven’t tried it but if you do, let us know how it goes! I made this last night and completely enjoyed it. I had a bit leftover and ended up combining with tofu to make a tofu scramble this morning. Oh my word – what tremendous deliciousness. Thank for the recipe. It’s a keeper (and a multi-tasker). I LOVE this salad, and crave it regularly. I do have a question about how you handle the garlic post-roast – when you say “squeeze out of skins” do you mean the paper only? I think I under utilize the garlic by only scraping out the gooey insides, do you include the ends as well? Hope this question makes sense :) I also always end up burning my fingers a bit during this step, any tips for how to do the squeezing with utensils instead? Thank you!! Hi Meghan! Yep just the skins! Keep the ends on and you’re good to go! Let them cool to ensure that you don’t burn yourself! This looks great and I’m planning to make it for our vegan guests (and the rest of us!) for Easter this Sunday. I saw your note that it will be good for a few days. I would like to make it ahead of time, on Saturday. Would you recommend stopping after massaging the kale and adding the dressing right before serving on Sunday? What about the chickpeas…will they stay crispy in the fridge, or should those be done day-of? I just tried making this and it’s delicious! I think my dressing might have gone a little wonky though, because it was very thin and didn’t look like your pictures. I think it was the tahini I bought from Whole Foods. Is there a brand of tahini that you buy for this recipe? I just made this recipe today and it was easy and really flavorful! I didn’t really think that massaging the kale with lemon juice and olive oil would improve the flavor, but it did make a difference! Great, hearty recipe. Not gonna lie, its late at night, and I’m in a rush to get dinner cooked and myself to bed. I don’t have the seasoning blend that your recipe called for, so I decided to make it myself. I did not realize that you hadn’t put the exact measurements of each spice needed, so I literally put 3 Tbsp cumin, 2 Tbsp garlic powder, 2 Tbsp paprika, 3 tsp ginger, 2 tsp coriander, 2 tsp cardamom into my chickpeas. Realizing what I had done, I added another can of chickpeas. and a can of diced tomatoes to try to help even things out. There is still way too much seasoning, and it doesn’t taste good. It tastes like a spice jar, and there are all these wasted ingredients. I know its my fault, but it would’ve been fail proof and really really helpful if you had put the exact amount of spices needed, not just the ratios. Otherwise, the recipe looks good, and next time, I will just make the extra trip to Whole Foods. Not sure if this is helpful for you but I just throw garlic powder, paprika and chilli (and salt and pepper) on the chickpeas…i’m usually pretty generous with my spices too (I add about one to two tablespoons of each of those noted spices) – even a small can of chickpeas can handle that flavour in my opinion. I think the ginger and cardamom (in higher quantities) and DEFINITELY the tomatoes would not have left you with a very nice tasting meal. This is honestly one of my favourite salads and oh my gosh THE DRESSING! I hope you have a chance to make it again. It is super healthy and actually incredibly satisfying! Suggestions to prevent the garlic from burning? The garlic did just that when I tried it and it was unusable:/ Also, any tips to make the chickpeas crispier? Hi Ashley! This should help you never burn garlic again! As for cooking crispier chickpeas, this should provide some tips! Holy moly! This salad is so good. I made it this afternoon and promptly had 3 bowls in a row. The chickpeas didn’t get *quite* as crispy as I would have liked, but I think that’s my wonky stove and not the directions. Dana, your blog is quickly becoming one of my favorites. Hi! I have not tried it but that should work! Let me know how it goes! I am new to your website. I made this for dinner tonight. Oh my!! I loved it and was sad when it was gone. This is a brilliant recipe. The flavors all blend so nicely it is a yummy treat for your mouth. I had a chard, kale, spinach blend from Costco on hand so used that. So good!! Thank you so much! I am looking forward to trying more of your recipes. Just made this and it was so perfect! Can I use fresh chickpeas instead of canned? We haven’t tried it but I think that should work! Thank you for a recipe that I have now gone back to again and again.. the dressing is so good on this and other things too. Made this today for lunch. It was just what I was looking for! I eat salads pretty frequently and was looking to switch things up a bit. This was hearty and filling with the Kale and I loved the use of the chickpeas. Some of my garlic got a bit “overly toasted” and were hard to break up so I threw everything in the Vitamix, so delish! I think I will be keeping this recipe in the rotation! I shared it on my FB page as well, I know plenty of other women that are looking for something healthy that isn’t the same old boring salad! Every recipe I’ve tried from your website has never disappointed and now here is another one to add to my growing “favorites” list. This is so freaking good. For the chickpeas, I didn’t have the seasonings specified in the recipe but I did have some Ethiopian berbere seasoning so I used that. Super good! Thanks for another great recipe. Added some room temp cooked sweet potato, cubed, to the salad, and it was really good. The sweet potato was a nice addition. I made this the other night with a girlfriend who recommended it- not only did was it so easy to make, but it was TO DIE FOR. The only “adjustment” we made, if you will, is we baked the chickpeas longer because we wanted them super crispy. This is going into my regular rotation. Thanks you for this deliciousness! I found this on Pinterest and made it tonight as written. Delicious! I had leftover dressing so may have it again tomorrow. Thank you. ? Just made for myself and my husband!! SO GOOD and I’ve never been a fan of kale. Great news! It’s our favorite, too. I made this tonight and it is SLAMMIN’! The roasted garlic is so delicious in the dressing. This one is a keeper for sure. Thanks for sharing! I don’t know if this happened for anyone else, but a bunch of the garlic exploded in my oven! Just spent about half an hour cleaning it up! Yikes, never heard of that! A healthy and delicious kale salad thank you! I added quinoa and roasted sweet potatoes Yummm! So delicious!!! I spiced my chickpeas with Mexican seasoning, added cayenne and a little bit of yellow curry powder and they were delish!! Love all your recipes Dana! Wow wow wow! This salad recipe looks so yummy that I just had to feature it in my “Sensational Summer Salads” roundup! I really enjoyed this recipe! I did about four cups of chickpeas for my family of four. I also used half as much tahini and used every bit of the lemon juice– my two lemons must’ve given me almost half a cup! I added a cut up avocado to the top and poured some extra lemon juice over the top of the whole thing. I also served with orange slices because I found myself craving them as I was tasting the salad during prep… Thanks for a delicious recipe, I have really been enjoying your blog recipes! Really liked this recipe! I’m not usually a kale salad lover but this one was dressed well enough that it wasn’t too crunchy. It held up well the next day too for leftovers. The dressing made too much but that’s okay. It took a little while to make because I decided to make the dressing in the Vitamix so the garlic would be thoroughly processed — worked well. I’d make it again! Love this recipe! Even my two young children are willing to take a bite! I however didn’t use the tahini in the recipe… Instead i just took a few spoonfuls of chickpeas and added them to the dressing in the blender. Such a keeper! Thanks for helping to make Kale our number one choice for salads! I don’t think the recipe needs adjusting as written, but I did do a few small things different…I made homemade tandoori using the above as a base but added smoked paprika as well as regular, and small amounts of cinnamon, cloves and cayenne. I used dark maple syrup (#3) in the dressing, as well as adding bits of sriracha and garlic powder, and a few small shallots which I had roasted along with the garlic and chickpeas. A mortar and pestle worked great to combine the dressing. I’m a bit of a kale newbie so I tried with lacinato/black kale cut in thin strips. As most people say, everything was amazing! I might cut back the tahini just a bit, but I liked that amount of lemon juice. Thank-you so much! I made this yesterday and I needed to make adjustments before it was just right for me. 1 1/2 lemons was plenty tart; I’m glad I stopped there. The raw kale was too tough to stab easily with my fork, and consequently unsatisfying to eat, so I baked it for 10 minutes, broiled it for 1-2 just to be fancy and toast some edges, and then it was just perfect enough to stab! After I poured the dressing on it was waaaay overdressed. I had to go to the store and buy another bunch of kale to add. I would use half the dressing that the recipe calls for. But even after all of these adjustments it was incredibly delicious! Just made this. It was delicious! Thank you! Wow. Great salad dressing. Thanks! Just made this- SO GOOD. Made a portion for myself but then my boyfriend and his brother were jealous after they tasted mine so I ended up making 2 more salads! Followed the recipe pretty much exactly except I had to roast my chickpeas for longer so they would crisp up nicely (about 30 min) so I had to take the garlic out earlier than the chickpeas. Also, I squeezed about half of the garlic cloves into the dressing and half right into the salad as an additional topping- it was amazing! Highly recommend. Awesome, awesome, awesome!!! Made this at a party I was hosting and it got so many raves reviews, I brought it to Thanksgiving dinner and the guests loved it! I got several requests for the recipe. PS..saved the dressing and improvised with a tuna, bean and romaine salad the following day and it was delish. Just tried out this recipe, and it was amazing! The dressing is PHEONOMINAL and totally made me forget I was eating kale. The only thing I have to say is that this doesn’t really make a good amount for 3 people. Definitely double up if you’re serving more than 2. Besides that, wonderful flavors, delicious! This is fabulous. Even my 7 yo and husband who are not mad keen on raw kale liked it. 5 yo ate it but condimented with tomato sauce. I served it up with roast potato / sweet potato and some steamed brocolli to fill it out a bit more. I added some sriracha to mine. The chick peas were great. I didn’t bother with oil though – just baked them and the garlic on baking paper and it worked fine. Will def make again. This one and the white bean one were great. Oh my goodness! This looks absolutely savory & delicious! I cannot wait to try it :) Thank you for your yummy recipes! For those of us who aren’t huge thing fans, do you have suggestions for a full or partial substitute? Thanks! I’m sorry, I don’t understand your question. I have Garam masala spice…think I could use that instead? I’ve always made my chickpeas this way and then separated the batch of chickpeas into smaller portions to eat as snacks. I never thought of using kale to turn this into such a beautiful dish. I’ll definitely give this a try today. Looks yummy and nutritious! I made this (more or less) last night. It was amazing. I didn’t have ingredients on hand to make the dressing, so I used Annie’s Organic Goddess (which seems similar) instead. I also added some sliced radishes and some diced up roasted cauliflower that I had left over from something else. I think I’m in love with kale now. Will definitely be making this one again (and again). Wonderful! So glad you liked it, Deborah! Just had this for dinner–amazing and delicious!!! This is my new favorite salad! I’m seriously considering running to the grocery store just to pick up more kale….with all 4 kids in tow….now that’s saying something! Such a great tip to massage the kale! I have tried kale in salads before and could barely get it down, but this….this is amazing. It was super soft and perfect! And the flavor was not overwhelming at all. Excited to try your other kale salads now, too! This is the most amazing salad. It took me to freaky town and I never want to come home. I thought it looked good, but I didn’t realise I would want to eat it nine times a day. Thank you MB, great job! Tomorrow is chocolate Quinoa bowl. Expectations are high. This was delicious and fulfilled all of my cesar salad dreams and then some! Amazing- great different twist on a kale salad. The chick peas are delicious! Great job! made this for a party this weekend: turned out amazingly! dressing was delicious, and the crunchy chickpeas were a great touch. Wonderful! Thanks for sharing, Alissa! 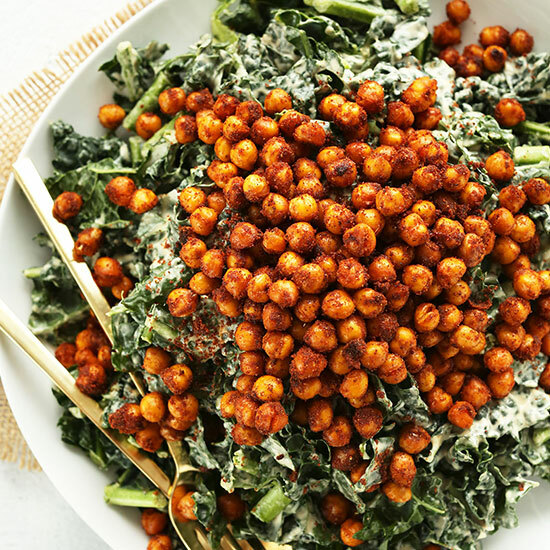 I made your kale salad with tandoori chick peas for a family pot luck. There were no vegans or vegetarians there (and I am neither, although my daughter is vegan) but several gluten-free folks so that is what I was looking for when I found this recipe. The dinner was billed as a vegetarian’s nightmare, so you can get a flavor for the tastes of those present (including my own). The reaction to the salad was overall very positive and several people commented on how unusual it was, asked what was in the dressing, what was on the garbanzos (chickpeas), etc. We all had serious garlic breath from this salad! I will definitely serve this again, especially as a hearty salad option that can serve as the foundation dish for vegan guests when I am having them over for dinner. I gave it four stars because, even when massaged, kale is still pretty stiff and chewy. I may try mixing in different kinds of greens next time. The dressing and seasoned chickpeas, though–five stars for sure. This recipe looks amazing! Would it be weird to use hummus instead of tahini? Also is there an oil free way to bake the chickpeas? Trying to avoid refined fats. I just made this and was very pleased. I added grape tomatoes from Trader Joe’s and it was seriously very satisfying and filling and full of nourishing food. Thanks Dana! I’ll look for it! Thanks for sharing, Carey! HELP…I just made this and it is amazing! However, my husband has severe allergic reactions to tree nuts and I read that if you’re allergic to nuts you’re likely to be allergic to sesame seeds, especially tahini. I’m so bummed that he can’t have it. Is there another possible substitute? This is delicious! I am taking it to a wedding potluck today, thanks for the great idea! After reading the comments on how good this recipe looked, but not many comments from people who have made it… well let me even the score a bit. This recipe was AMAZING. Everything.. just everything was great and I wouldn’t change a thing. The roasted garlic/tahini dressing was my favorite part. High Fives girlfriend!! Unfortunately, I found the salad completely unsatisfying. I spent over an hour making it, and I’m an experienced cook. Tahini takes over the dressing so basically it tastes like kale mixed with tahini. I was looking forward to the interesting spice mix, I mixed it myself per the recipe, with garbanzo beans and it the beans didn’t taste good either. I’ve made much better roasted beans with just garlic, sald and olive oil. Definitely not making it again. Love this recipe! I’ve made it twice and both times it was delicious. However, I can’t get the consistency of the salad dressing as thick as in the pictures. Any tips? This recipe is very good. I brought it to two BBQs and everyone loved it! I did find that some of my chickpeas weren’t super crispy but some of them were, so maybe I didn’t coat them evenly enough with oil. You can also bake them longer, and then let them cool for 10 minutes before adding to the salad. That always helps them crisp up more! Wow, great minds think alike. I was on the site looking for desert recipes and saw a pic that look exactly like something from my own kitchen. 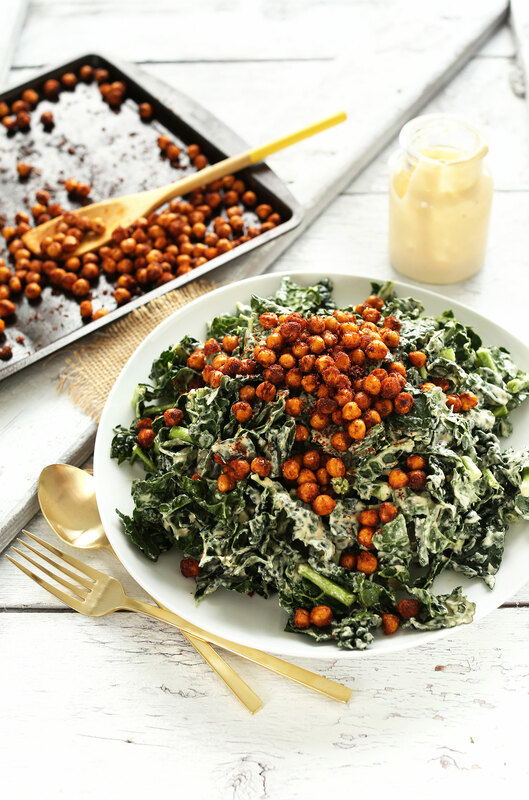 My absolute favorite lunch is my garlicky kale salad topped with buffalo chickpeas. Keep inspiring! This is delicious! Shredding the kale and massaging it make it tender and the dressing is so tasty. I added some shredded carrots for a little extra color. We really enjoyed this. The dressing tasted great and stood up well to hearty kale (we used Tuscan). My only complaint would be the chickpeas didn’t get crispy – they dried out but that was it…maybe I’ll add a bit more oil next time. PS – I made the Tandoori spice from the recipe, and it is a keeper! Yes, try more oil next time! That will help them crisp up. Am I wrong to think the chickpeas needed salt and the dressing was too sweet and needs soy sauce or brags amino to balance it?????? I did think it was a little sweet (used honey), but also thought the kale (Tuscan) helped tame that. Nevertheless, I will use less next time. Definitely store it separately! Best of luck and thanks for the love, Rachel! fantastic recipe. We all loved it, even the kids! Healthy and really delicious. I would even serve this at a dinner party. I always modify recipes to suit my taste. In this case I used less maple syrup and more garlic for the dressing. I also added a bit of schriracha and cinnamon to the tandoori masala and tossed crumbled feta with the kale. By the way – I didn’t use your method for roasting garlic so cannot comment on its effectiveness. I always roast several heads of garlic at a time as its a staple in my house. Not sure why everyone thinks it takes so long. I use my clay garlic roaster and they’re done in 30 minutes. Yay! Thanks for sharing, Patti! I added additional two raw, chopped cloves of garlic into the dressing to add an extra kick for my extra garlic loving family, perfect for us! My chickpeas never got crunchy though, and my roasted garlic a little over done (but loved the tip about separating them to cook faster!). When i make again, i think i will remove the garlic at 20min and continue cooking chickpeas for an additional 20-30. Thanks for the recipe… I made it tonight and LOVED it! The “quick” garlic roast worked for me and the dressing recipe is really flexible — I had the garlic and tahini, but I used fresh lime juice and white wine vinegar to brighten it up and it was amazing! (I didn’t have lemons on hand) I’ll be making this again! I followed this recipe to a T and halfway through I heard this popping sound in my oven. The garlic cloves were exploding. So now I have no garlic and an oven full of burnt garlic. Probably should warn the readers. I’d MUCH rather spend the time roasting garlic the proper way than deal with this. Emily, I’ve never had that experience not heard anyone having that experience. Was your garlic wet or near water? Not sure what went wrong!! I also experienced “exploding garlic”…though it was just the skins bursting and the clove itself was fine and intact. I do second the comment from a previous poster who recommended turning the garlic halfway through or monitoring it more closely. (I walked away from mine and left it alone until I heard the noise. :-) I think the cloves were a little small and some dried up into crispy bits while the chickpeas were still soft. In my case, it was a bit hard to balance the two things at the same temp/time. In the future I will put them on two trays so I can tweak the time if needed. Loved the dressing, though I had to double it due to a kale measuring mistake! LOL! Any substitute for the tahini? Love this recipe, I’ve made it a few times now. I’m wondering how to make a thicker dressing, add more tahini sauce? less lemon? Super yummy and healthy recipe! Thank you for sharing! This salad is insanely, rediculously, delicious. It is so delicious that I almost feel guilty eating it. There is a little voice inside my head that tells me tahini is high in calories. I can happily ignore it and say rude things to it because this salad is also wicked healthy. Is there a substitute for the cardamom? It’s the only thing I don’t have on hand. Thanks! Excited to try this! Wow, first time i have ever massaged kale, I was a little nervous but I can’t believe how easy it was! The dressing is so delicious, too. I did the DIY tandoori mix which went well, but I have to say that I thought the chickpeas tasted dried-out and without too much flavor. I don’t know if I should’ve dried them more thoroughly before cooking or not cooked them for as long – any ideas? Thank you, love your stuff! I want to try this with steamed kale! I’m not too into cold foods (yeah I don’t know why either) and think that warm salads are entirely underrated. This is, quite possibly, the BEST salad I have ever tasted. Hands down. The garlicy dressing alone is worth the price of admission. I am loving your website. Your recipes are amazing. I can’t wait to share some of them with my daughter and her husband. They are coming here from India on Tuesday. I am planning on writing about your blog on mine. I thought I would say something about some of the recipes I’ve tried and then link to the recipe. May I use a picture from your blog by each one of the items? Doubled this recipe, as I know it would be delicious. We had leftovers in these giant flat bread wraps I tried from Whole Foods. So amazing. Thank you for this recipe! I made this salad for dinner tonight and it was dee-licious! The recipe was easy to follow and the flavors were fantastic. I had some butternut squash ravioli in the freezer that I made a few months back and they were the perfect accompaniment. I see a future for this salad in my weekly meal rotation. Thanks! Delicious! I just devoured a plate of this wonderful salad. Love your recipes! Made this last weekend, and it is seriously delicious (and easy, and filling). Added some roasted asparagus just for fun. This looks off the chains girl. I want it for breakfast tomorrow! I mean… that dressing. DROOL. 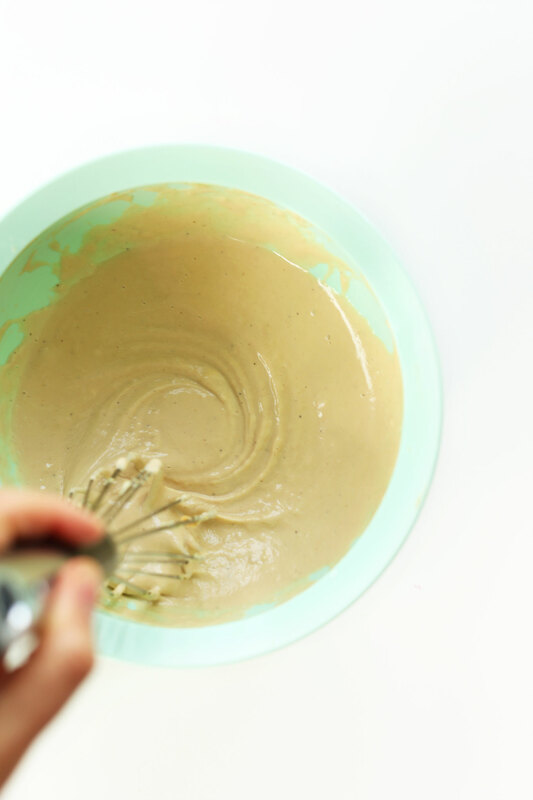 Do you make your own tahini ever? I have! Just kinda lazy at this point and the store bought is SO creamy! We have loads of baby kale just getting started in our garden, so when I saw this recipe I had to try it. It was delicious!!! The spicy chick peas added a wonderful crunch and the roasted garlic in the dressing was inspired. I added a few whole wheat croutons on top, but otherwise followed the recipe as written. We will definitely be eating this again- maybe tonight! Hi Dana! I made this recipe last night and it was so delicious and effortless. I used 2 tablespoons of maple syrup, but would probably reduce it down to 1 next time as I prefer dressings to be on the tangier side and it was quite sweet.. The chickpeas were a perfect compliment to the richness of the dressing. Thank you for another winner of a weeknight meal, your recipes never seize to amaze me. SO GOOD! My extremely meat-and-potatoes-type, kale-phobic boyfriend kept sneaking chickpeas and pieces of kale from my plate, too. Substituting smooth natural peanut butter for tahini worked well, as did using un-roasted garlic and topping it with parmesan. Great to know! thanks for sharing, Eleanor! 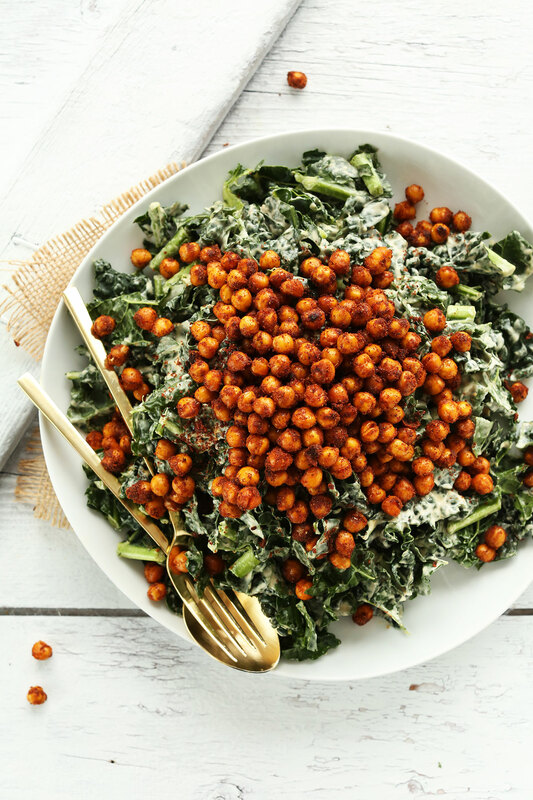 This is so yummy and delicious, both kale and chickpeas are so versatile, they’re super tasty in complex salads or simply baked while seasoned with salt. The garlic tip was brilliant, such a big time saver, thanks for sharing that, Dana. Made this today and absolutely loved it – have sent you a picture on instagram. Thank you for all your wonderful ideas. this one looks green and delicious. And I think silan (date syrup) could work wonder here instead of maple, if only for the combination with thaini. For the chickpeas- what does “thoroughly dried” mean? Overnight? Oh no, just rinsed and patted dry so there’s no residual water! “THIS WAS SO GOOD” said the girl who normally has to choke down kale. I think I’ll make this again and again. Thank you! This salad was THE BOMB. Never in my life have I been able to say that I’ve eaten an entire bulb of garlic in 24 hours…until now. So good! Kale is my new salad go to. It’s crazy to think it was once only used for garnish. Pinned and added the ingredients to my shopping list. Can’t wait to make. This salad looks insanely delicious!!! Made this for dinner tonight. So fantastic! I threw in a little spinach, because I love spinach. When I got home from work, I was shocked and dismayed to discover we did not have a can of chickpeas, so I had to use black beans instead. Still totally delicious! Great to know! Thanks for sharing, Shannon! 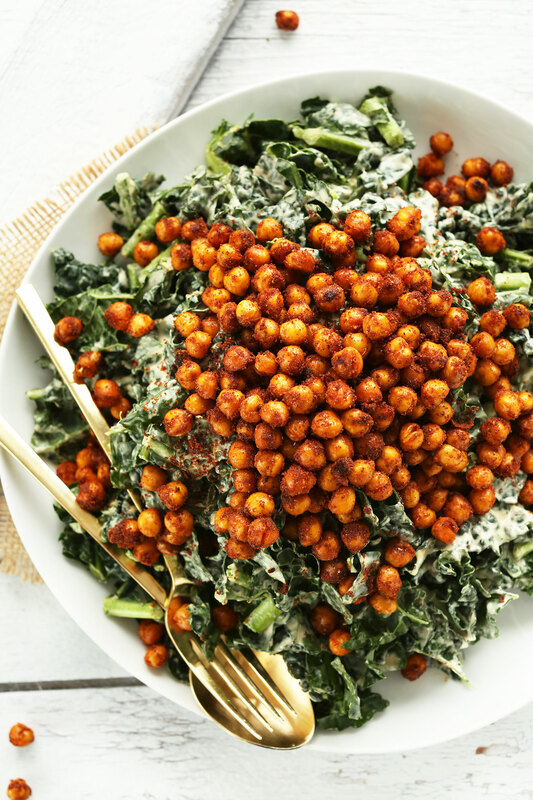 Massaged kale salad with this fabulous dressing and crispy chickpeas is just what I crave! Garlic, absolutely, and the more the merrier! Thank you for the garlic roasting tip. I’ve not tried Tandoori spice but am looking forward to putting it together because I like spicy! Delicious salad, Dana! Thank you! yay! Thanks for sharing, Traci! 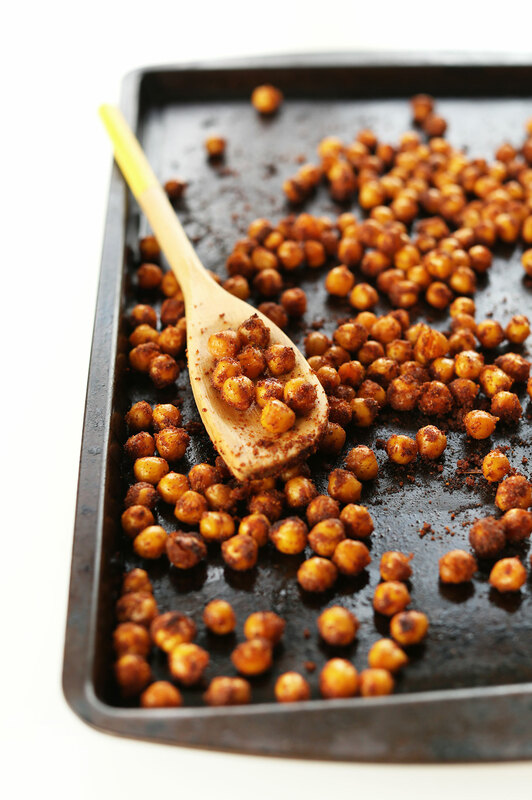 Ok, This is unreal…Chickpeas rock but crispy chickpeas…Get OUT…Drooling over this recipe! Who needs chocolate when they’ve got a salad as sparking as this? Thanks Ana! Hope you love this one! Thanks for sharing this awesome recipe. Is there a substitute for the Tahini? one of our kiddos is severely allergic to sesame. This salad looks delicious! This looks incredible. It is definitely on the menu for next week. So excited to stuff my face with these flavors. There was a time it seemed I was eating Kale salad everyday for lunch. This is one I will have to add to my list of Kale salads, and I think I may have to give Kale scramble a try. Yay! Thanks for sharing, Meli! how much water do you add to the dressing?!? Not much, about 3-5 Tbsp? LOVE this faster way to roast garlic and roasted garlic is one of my favorite things ever!! This salad looks incredible! Pinning it for sure! Thanks Lynn! Sending hugs from Oree-gon. I love the idea of roasting the garlic cloves while still intact, but having roasted garlic at the end of roasting the chickpeas! 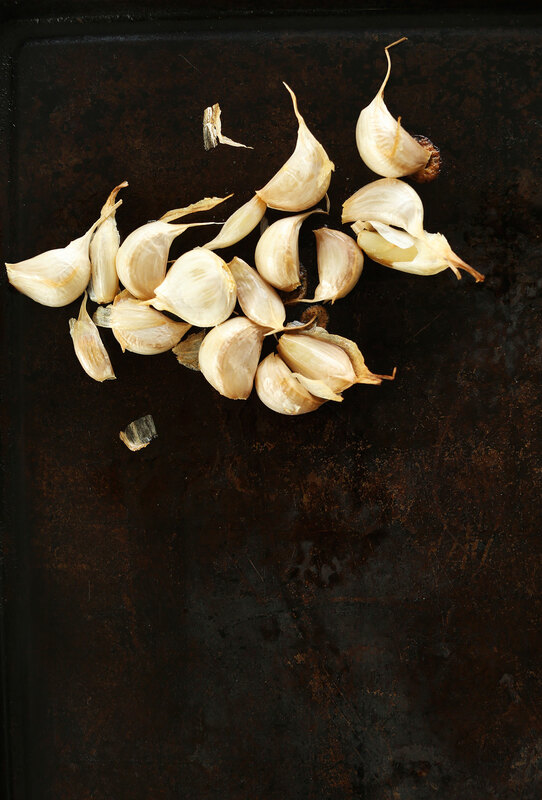 Multi-tasking in the kitchen is always welcome….as is roasted garlic!! Will for sure give this method a try :) thanks for the inspo!!! This looks amazing. Can’t wait to try it. Do you have just a savory book. I don’t eat desserts. We have a 31 Meals cookbook with all savory meals (see navigation tab). And our print cookbook due out this fall will be primarily savory dishes as well! Stay tuned. Oh boy, I have to say I have NEVER drooled over a salad recipe before. Until now! I can’t wait to try this – it looks absolutely mouth-wateringly good! Best compliment! Hope you love it! This salad looks like a nice, warm hug!! I just love those chickpeas! OH man. You are speaking my love language here. Kale salads are my favorite because, yes, nutrients, but they also stay good for days without getting soggy! The roasted garlic dressing needs to happen in my kitchen asap. I also have to ask – where oh where do you get your backgrounds? Do you just have the luckiest thrift store finds? Ah, thanks friend! I got this at a vintage shop and spray painted the wood white! I’ve been making more recently and loosely plan to do some tutorials so stay tuned! I noticed to too! Printed several recipes … this one looks Ah-mazing..! This is all sorts of gorgeous! OMG the dressing. The. Dressing! I’d have to try and make this with Tuscan kale, as I can’t find curly kale around here…I’m not too sure about eating it raw – it can be a little tough. I am guessing it needs lots of massaging? The massaging definitely helps! And the dressing (which is kinda sweet) helps things out, too! Hope you give this a try, Valentina! Major Yumsies! Is that the Trader Joe’s Organic Tuscan Kale I see? Yes, kale salad, any time! Dressing must be so good, but I have to roast garlic when my husband is not home, otherwise he’ll devour it before I realize its gone. A week back, I found a recipe to make crunchy chickpeas by soaking them and then baking. I’ll have to try to use cooked chickpeas, it might be easier (and faster too, right?). Thanks for the recipe, Dana! haha, nice! Who doesn’t love roasted garlic?! What I love most about this recipe is the different texture. Kale salads are one of my all time favorite things and something crispy (that is not a crusty bread) sounds like pure perfection. Whoop! Let me know how it goes, Nicole. I’ve been needing a great salad recipe and this one looks amazing! It hits all the notes I need in a salad- nothing too sweet, a great dressing, and something fun to eat in between the leaves. Perfection! Can’t wait to try! I love tahini and chickpeas! :D Yummy! But… how did you know? My diet is literally kale and chocolate. It is perfect harmony. Exactly my thinking! Hope you love this one Sara! AMEN. Working on it though. In the meantime, quick roasted garlic! I cant wait to try this – it looks and sounds perfect. This dressing looks DIVINE. And your idea to roast garlic cloves separately is much welcomed over here. Who has time to roast garlic for an hour when you want it NOW? Thanks for sharing! Haha, you get me. Hope you love this technique and recipe, Emily! I’m not a big salad fan but this sounds delicious. I had not idea what to make for dinner tonight but now I do :) Thanks! This looks and sounds like one of those lunches you could have evvvvery day. Way to kill it with those flavors! Tellmeaboutit. I just did! Thanks for the kind words, friend! This looks delicious! It reminds me a bit of one of my favourite recipes of yours, the roasted sweet potato with baked spicy chickpeas and tahini sauce. Will definitely try this one out, and I’ve no doubt I’m gonna love this one, too :) Thank you! Yes! It’s very similar just heavier on the greens! 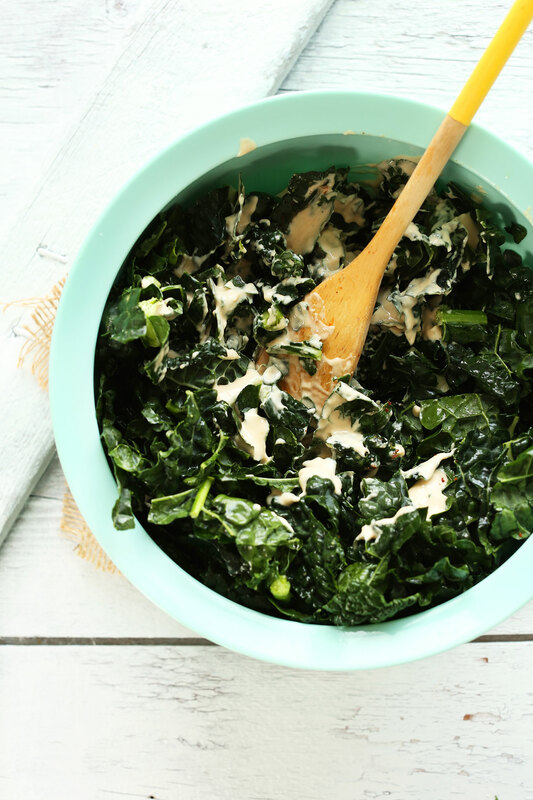 This looks so good – now you’ve got me craving kale salad! I bet roasted garlic in the dressing would be UH-MAZING too!! It makes it so mellow and kinda sweet. So into it!